Are the most dangerous vertebrate. Are the large herbivore mammal. Are native to the African continent. Lives about 40 - 50 years. Are very aggressive towards humans. Use their sweat as sunscreen. Eats grass, fruits, leaves and nuts, aquatic plants and reeds. Like to laze in the water or basking on banks of the river during the day. Eats about a 100 lbs of vegetation in one go. Give birth in the water. The closest relatives are whales and dolphins. Their milk is bright pink. 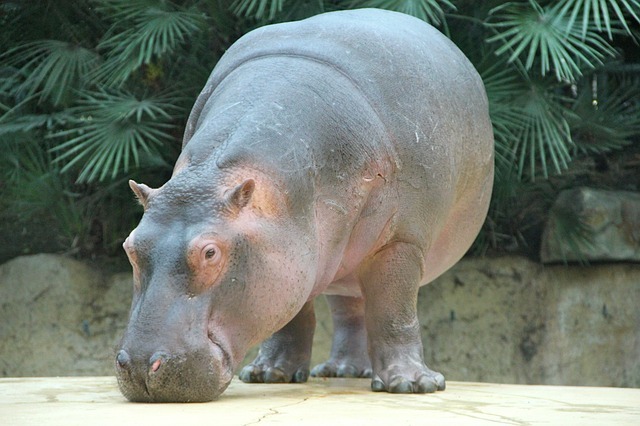 There are about 1,600 calories in a pint of Hippopotamus' milk. Can stay underwater for approximately 25 minutes. Babies weighs about 100 lbs at birth. An adult weighs about 4,000 lbs.